Il mitico Detective Conan arriva nella serie SH Figuarts di Tamashii! La figura e' articolata e molto dettagliata e dispone di numerosi accessori: due palloni, volti e mani intercambiabili, una testa opzionale. 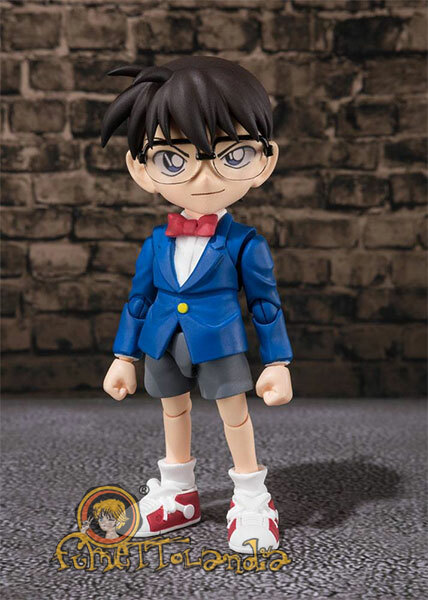 The legendary young detective EDOGAWA CONAN joins the S.H.Figurarts line! The figure includes a wide variety of effects and options to capture all of Conan's expressions from the series. It even includes two soccer balls with different shapes (one normal, one in mid-kick!) Re-enact all of your favorite scenes from the anime with this gorgeously rendered action figure. It stands approx. 9 cm tall and comes with accessories and interchangeable parts in a window box.